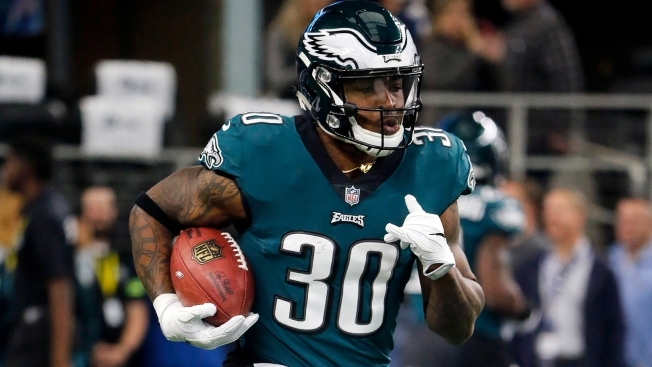 Corey Clement (knee) and Sidney Jones (hamstring) are both listed as questionable to return. ARLINGTON, Texas - The Eagles lost two players in the first quarter who might be able to return. Jones injured his hamstring late on the Cowboys' field goal drive in the first quarter and Clement got hurt saving a fumble on the Eagles' ensuing drive. At running back, the Eagles still have Josh Adams, Darren Sproles and Wendell Smallwood, who is still active. The bigger problem might be at corner, where the Eagles are thinner. De'Vante Bausby has taken over for Jones, but that leaves the Eagles without another backup corner. Chandon Sullivan is inactive today. The Eagles decided to keep an extra offensive lineman up this week. Ertz is breaking records, but what do Eagles' other TEs think?